I think the defense of the tradition is one of the most serious and most noble way to mark the identity, not only of an extraordinary product such as the Neapolitan pizza, but to bring out and enhance the identity of a culture and a territory: Napoli, the beautiful capital of the Southern Italy and former capital of various kingdoms. Loved by the whole world, Naples has the duty to preserve with love and jealousy its historical heritage that is culture, art, music, architecture, gastronomy, folklore and much more. The pizza is one of the jewels of this enviable heritage. To learn more about the true Neapolitan pizza we interviewed Antonio Pace, the President of the Association which preserves the memory and the characteristics of the real pizza, having promoted a specification accepted by all over the world. 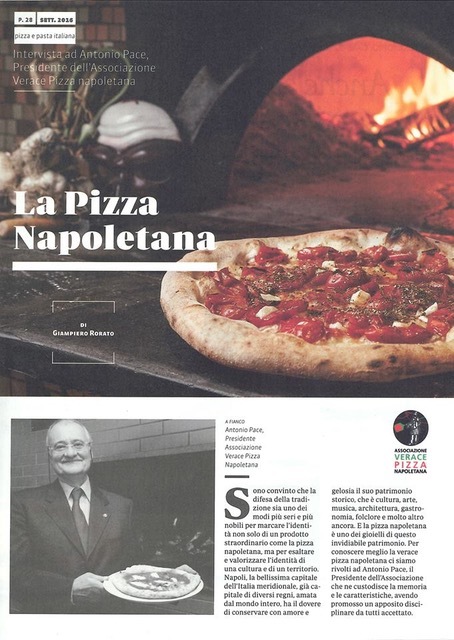 Q Mr. President Antonio Pace, the Pizza Napoletana is produced successfully all over the world. What is really the difference from other artisan pizzas made by so many pizza makers in Italy and abroad and how do you evaluate these different pizzas from the taste point of view? Even if everybody identify myself as a defender and promoter of the Pizza Napoletana, I always have great respect for all kinds of pizza and baked goods that are made in Italy because they represents the variety of the culinary culture that our country is able to express in each Region. I know very well the commitment and the effort that all the pizzaioli put in their own work, and I think the choice of the most pleasing product it is not up to me, but only up to the end users. The Neapolitan pizza is a disc of dough which characteristic is to be a highly digestible product thanks to a long leavening and maturation process. It differs from other kind of pizza from the looking, because, beside its round shape, it should be soft, folded in four, or as we say in Naples “a portafoglio” (wallet style), it must have a 1 inch rim and be thin in the middle. Q As far as concerning the ingredients needed for making a Pizza Napoletana, is there a possibility of using flour grinded by foreign wheat, tomatoes from various sources, extra virgin olive oil not of Italian origin? To be called Pizza Napoletana is it sufficient to make it with the traditional shape as it has been made in Naples? Even since 1984, when we wrote the first Regulations for making the real Neapolitan pizza, we promote, together with the Pizza Napoletana, the excellence of our territory with products such as San Marzano tomatoes, Italian extra-virgin olive oil, Mozzarella di Bufala Campana and Fiordilatte from Southern Apennines. Regarding the flour we need a different approach. Even though during the last few years we assisted to a rediscovering of some domestic grains, you cannot think that all the flour utilized by the pizza makers come from Italy. What characterizes our country is the milling technique that Italian flour producers have developed over the years. Q Who guarantees that the severe regulations indicated by the Disciplinare are diligently and successfully followed by the pizzerias displaying the signboard of the Verace Pizza Napoletana and which controls are performed, in which way and by whom? I never liked the word "control". I prefer to talk about verification. We never forced or pushed any pizzeria to join our Association. We want to maintain the affiliation as a voluntary choice because this is the way the pizzeria feels. Follow the Disciplinare means care to all the people who, entering in a pizzeria, expect to eat a specific product. 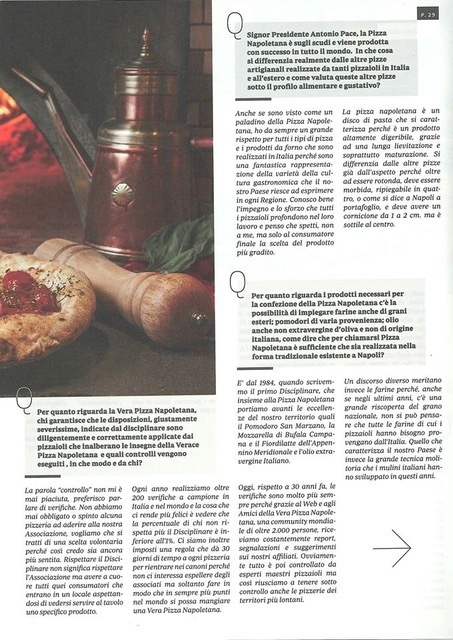 Every year we make more than 200 inspections in Italy and abroad, and what makes us happier, is to observe that the percentage of the pizzerias that doesn’t follow the Disciplinare is less than 1%. We also set up a rule that allow 30 days for each pizzeria to re-enter in the standard because we do not like to expel the members, but only to make sure that more and more points in the world are serving a Vera Pizza Napoletana. Today, compared to 30 years ago, the verifications are made more often because thanks to the web and to the Friends of the Vera Pizza Napoletana (a global community of over 2,000 people all over the world), we constantly receive reports, comments and suggestions about our affiliates. Obviously our expert master pizza makers are in charge to verify everything but, in this way, we can keep under control also the pizzerias located in remote territories of the world. Q The Neapolitan pizza is a product belonging to Italians, as a result of a history of centuries and a masterfully evolution leading to reach, in its form and in its substance, a high quality level. In addition to Campania, is it possible to find other places in Italy and abroad where to eat a Pizza Napoletana made following the specification? Whoever wants can now eat a Vera Pizza Napoletana all over the world, from Brazil to Japan, from Canada to New Zealand. The total number of pizzerias affiliated to our Association is now 620, distributed in 34 countries worldwide. 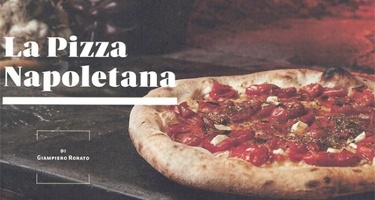 During the last few years, besides the territories that first started to promote the Pizza Napoletana such USA, Japan and the rest of Europe, countries like Singapore, the Philippines, Brazil, Argentina, Mexico, Kuwait and more, has been added to that list. The new discovery land will be Africa from where some important signs begin already to arrive. Q What do you think about the so-called "gourmet pizza" and how it can be considered in the world of pizza? I keep repeating that the term “gourmet pizza”, now commonly used, is wrong. We should instead talk of “pizza for food lovers”. 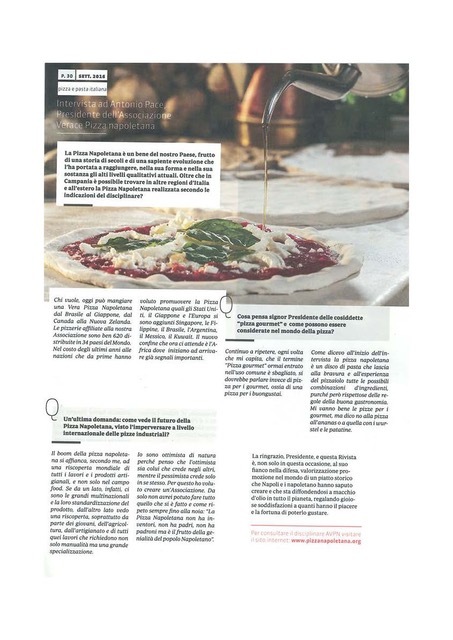 As I said at the beginning of the interview, the Neapolitan pizza is a disc of dough, which leaves to the skill, and the experience of the pizzaioli all the possible combinations of ingredients, in respect of the common gastronomical rules. I am in favor of all kind of gourmet pizzas, but I say no to the pizza with pineapple, hot dogs or French fries. Q A last question: how do you see the future of the Pizza Napoletana due the rampage of the industrial pizzas? In my opinion, the boom of the Neapolitan pizza is a part of a worldwide rediscovery of all the artisanal jobs and the handcrafted products, and not only in the food industry. If, from one side the large multinational companies are expanding with their standardization of the product, on the other side we assist to a rediscovery, especially by the young generation, of the agriculture, handicrafts and all the jobs that require not only manual skills, but a great specialization. I am an optimistic person by nature, because I think that the optimist is the person who believes in others, while the pessimist believes only in himself. This is the reason why I wanted to create an Association. Alone I could not do everything and as I always point out: “The Pizza Napoletana has not inventors, not fathers, and not masters but is the fruit of the ingenuity of the Neapolitan people.